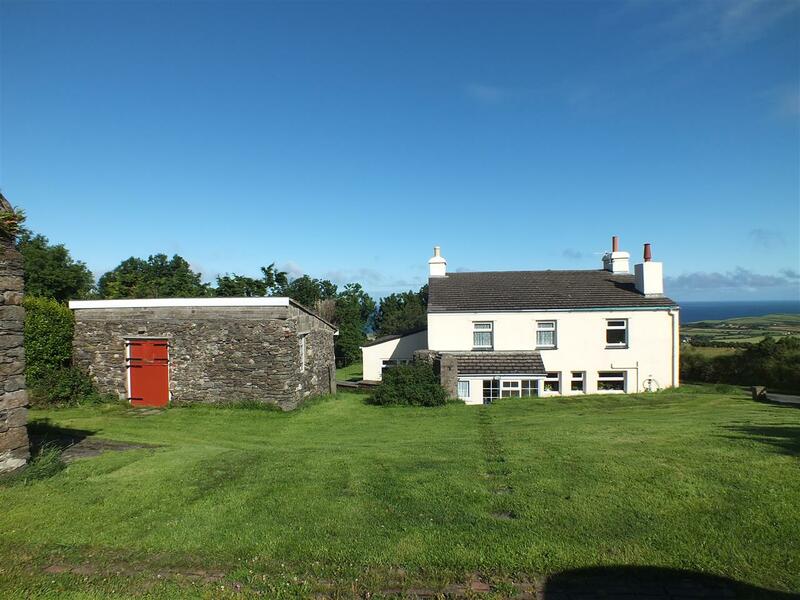 An Individual, Extended Detached Cottage Set in Approx 5 Acres. A Short Drive from the Village with Fabulous Garden, Rural & Sea Views. Lounge, Family Room, Dining Room, Sun Lounge & Breakfast Kitchen. Front & Rear Porches, the Latter with a Cloakroom WC off. 4-5 Bedrooms (3 Doubles, 1 En Suite Bathroom) plus Family Bathroom. Optional Wind Turbine or Mains Electricity. Full uPVC Double Glazing. Large Workshop / Store & Double Garage in Tandem. Off Road Parking. 2.5 Acre Field, Orchard and Expansive Lawned Garden with Patio Area. On entering Kirk Michael continue past Michael School, the Mitre Public House, village shops and post office. Take the next right turn after Slieau Curn, then follow the Baltic Road up for approximately 0.6 miles where the property will be found on the right hand side, with ample parking and turning space. Having a part decoratively glazed uPVC entrance door. Tiled floor. Part glazed door to the main entrance area with stairs leading to a split landing on the first floor. Power points. Doors through the sitting room and dining room. Having a recessed wood burning stove set on a slate hearth with a wooden mantle. Exposed beams. Having a uPVC window to the front looking out over the garden. Clear opening to the sun lounge. Telephone point. A well proportioned room with a pitched roof and uPVC windows to the sides along with uPVC sliding doors which lead out to the patio. Oak effect laminate floor covering. TV and points. An original room with exposed beams and spotlight fittings. Manx stone floor to ceiling fireplace with an inset glass fronted stove. Recessed, obscure glazed uPVC window. TV point and internet connection. Clear opening with a step down into the lounge. A large, L shaped, dual aspect room with uPVC windows enjoying sea and garden views. Matching wall and centre lights. A good size room fitted with a range of solid oak fronted base and drawer units together with laminate work surfaces incorporating a stainless steel sink with dual drainers. Inset gas fired hob with a stainless steel splash back and canopy filter hood. Built in double oven and grill. 'Worcester' oil fired boiler. Plumbing for a washer and dryer. Three rear facing uPVC windows. Space for a breakfast table and chairs. Understairs storage cupboard. Exposed beams. Clear opening to the rear kitchen (3.12m (10'3") x 2.79m (9'2") which is fitted with a range of base units and laminate work surfaces Gas powered fridge freezer. Rear uPVC window. Coat hooks. Glazed door to the rear porch. Having a sloping roof with a uPVC window to the rear and a uPVC door. Door to the cloakroom which is fitted with a classic suite of hand basin and WC. Natural light and ventilation via a uPVC window. Split landing. Cupboard housing the electric meter. Plug in, wall mounted electric radiator which runs off any excess wind power created by the turbine. Loft access. Internal obscure glazed panel to bedroom 5. Two power points. A spacious room fitted with an 'avocado' coloured suite of corner bath with a mixer shower attachment, pedestal basin and WC. Part tiled walls. Built in airing cupboard housing the hot water cylinder. A further built in cupboard provides a useful storage space with fitted shelves. Two obscure glazed uPVC windows. Shaver light. Fluorescent ceiling light. A single room enjoying views across the field to the hills beyond. Radiator. A generous, dual aspect single room enjoying garden and distant hill views via two uPVC double glazed windows. Currently utilised as a study with fitted shelving. Radiator. A further loft access and smoke detector. Power point. A superb double room enjoying distant sea views though the trees via a deep set uPVC window. A further high level window provides additional light. Fitted with a superb range of modern furniture comprising corner wardrobes, drawer units, bedside cabinets and display shelving together with overhead lockers. TV and power points. A well proportioned double room with two uPVC windows enjoying far reaching rural to sea views. Original feature fireplace with a Georgian grate. Vanity unit with an inset basin and shaver light above. A walk through dressing area leads to the main bedroom. 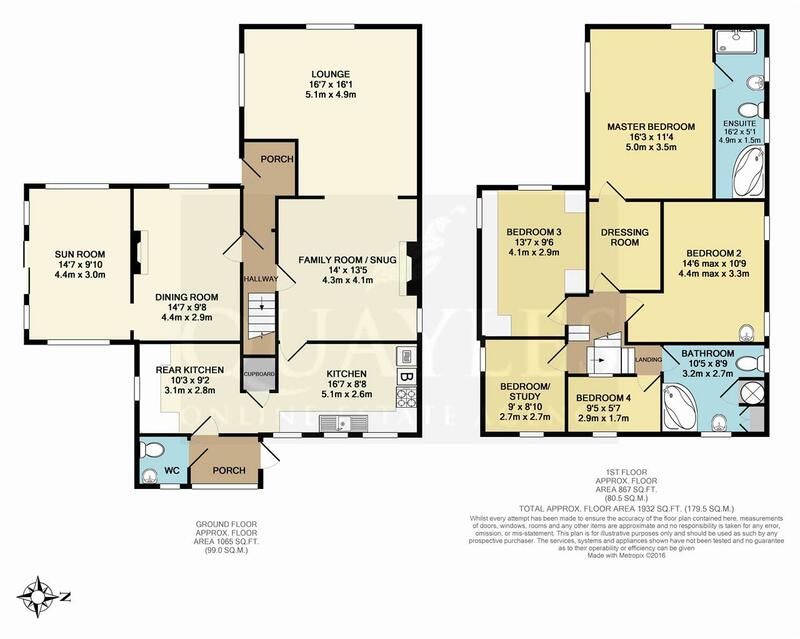 A superb, dual aspect room which could comfortably accommodate a 6ft bed if required. Two uPVC windows look out to the gardens, one having a partial sea view. Plenty of space for wardrobes and freestanding units. Loft access. Under floor heating controls for the en suite bathroom. Primarily tiled in pastel tones to complement the modern classic white suite of corner bath, WC and pedestal basin together with a good size, glazed enclosure housing a 'Gainsborough' electric shower. Two obscure glazed uPVC windows. Mirror fronted vanity unit. Recessed LED downlights. 'Silavent' extractor. Ceramic tiled floor with under floor heating. Accessed via a lane within the parking area and steps to the rear of the raised lawn. Approx 2 1/2 acres with natural hedge boundaries. Below the lane is a further natural garden area which leads into an orchard which is planted with gooseberry bushes and trees bearing eating and Bramley apples, pears, Victoria plums and crab apples. On the way to the formal garden is a concealed pond in addition to a good size Lily pond. Mature shrubs form the boundaries with a ditch at the furthest point from the house. There is a walkway through to the formal garden, which is well screened by mature trees and bushes. Laid to lawn with further mature trees to the boundaries and a good size greenhouse. Outbuildings incorporating garaging for two vehicles in tandem. A further petitioned area provides ideal storage for gardening equipment etc. Up and over door to the front. Additional area off the main building. Electric garage door. Solar powered remotely controlled light. Light and power. Sloping pitched roof. Housing a 7KW and 3KW Lister generator. Currently disconnected from the main power supply. A wind turbine located in a field alongside supplies the majority of the domestic electricity supply. In the event of insufficient wind, electricity can be obtained by manually switching to the mains supply. Please note, the mains supply cannot be used in conjunction with the wind turbine. Mains water and electricity. A wind turbine may be used in place of the mains electricity to generate domestic power. If using this method any appliances used must be below 3kw. Oil fired central heating. Further electric heaters utilise any excess electricity created by the turbine. Private drainage.